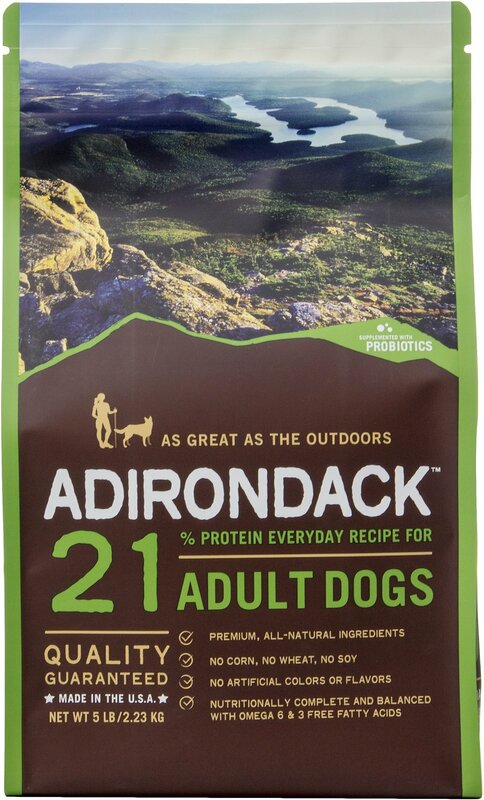 Feed your precious pup a food that’s as good as the great outdoors with Adirondack 21% Adult Everyday Recipe Dry Dog Food. Formulated for peak performance at all life stages, this premium-quality, all-natural food is enhanced with essential vitamins, minerals and nutrients to deliver complete and balanced nutrition. Added probiotics help support maximum nutrient absorption and overall digestive health, while omega-3 and 6 fatty acids help nourish her skin and coat. And because only the best will do for your best friend, it’s made in the USA without the use of corn, wheat, soy, artificial colors or artificial flavors. 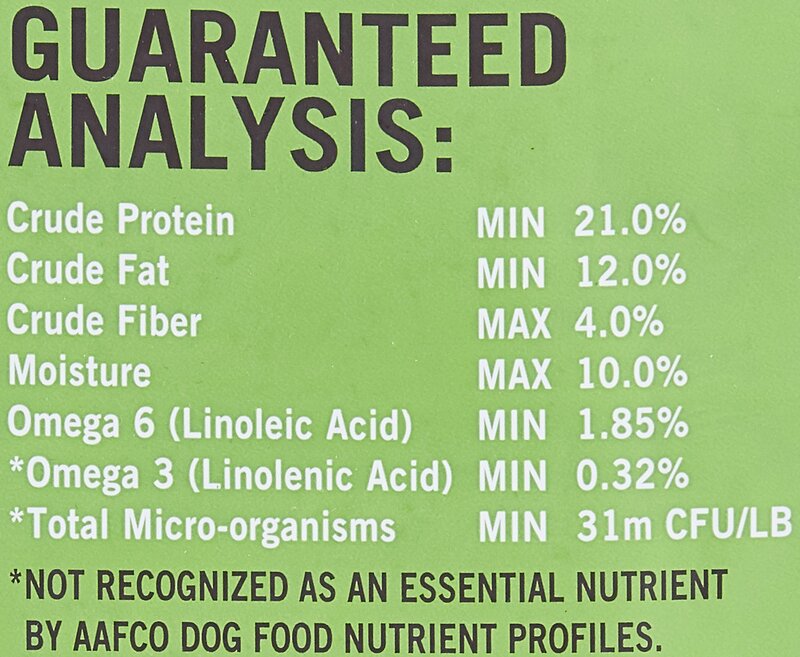 Premium-quality, all-natural food delivers peak performance for dogs of all life stages with 21% protein. Enhanced with essential vitamins, minerals and nutrients for complete and balanced nutrition. Added probiotics help support maximum nutrient absorption and overall digestive health. Omega-3 and 6 fatty acids from menhaden fish oil and flaxseed support healthy skin and smooth, lustrous coat. 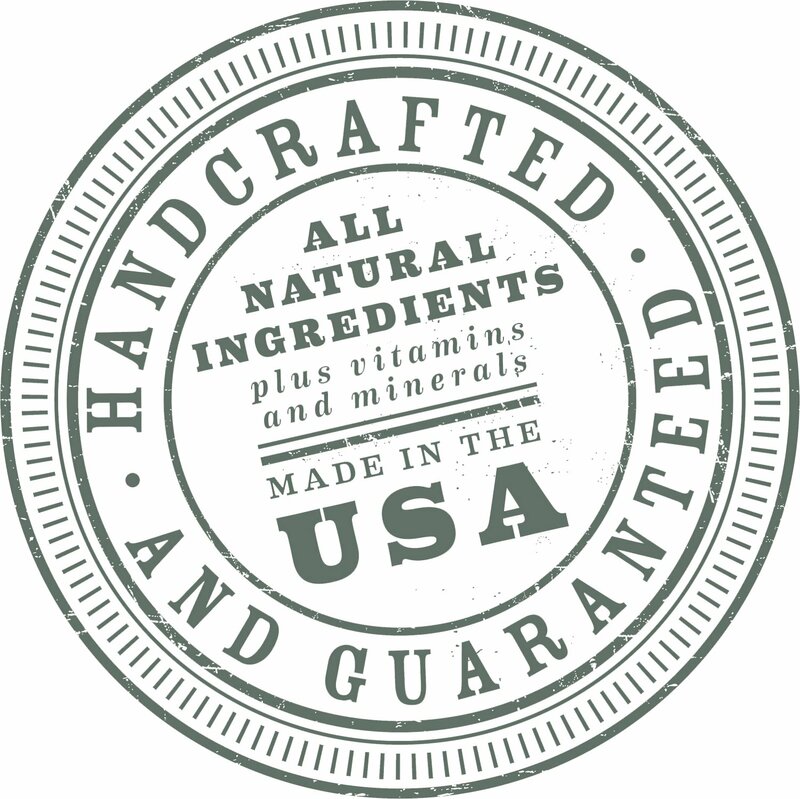 Made in the USA without the use of corn, wheat or soy, and no artificial colors or flavors. Pork Meal, Brown Rice, Ground Grain Sorghum, Oat Groats, Pearled Barley, Chicken Fat (Preserved with Mixed Tocopherols), Dried Plain Beet Pulp, Chicken Meal, Whole Ground Flaxseed, Natural Flavor, Potassium Chloride, Menhaden Fish Oil, Dl-Methionine, Lactobacillus Acidophilus Fermentation Product Dehydrated, Choline Chloride, L-Lysine, Vitamin E Supplement, Ascorbic Acid, Niacin Supplement, Organic Dried Kelp, D-Calcium Pantothenate, Riboflavin Supplement, Biotin, Vitamin B12 Supplement, Thiamine Mononitrate, Vitamin A Acetate, Pyridoxine Hydrochloride, Citric Acid, Vitamin D3 Supplement, Folic Acid, Iron Sulfate, Zinc Sulfate, Zinc Proteinate, Iron Proteinate, Copper Sulfate, Zinc Oxide, Manganese Sulfate, Manganese Proteinate, Copper Proteinate, Manganous Oxide, Sodium Selenite, Calcium Iodate. I thought this would be a really good food and my dog really likes it but it gives her the most horrible gas. She never gets gas - only with this food and what a weird strong smell it is. Very disappointing. 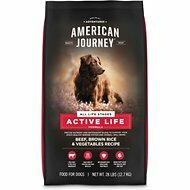 My dog has made noises I've never heard before (and smells) after changing to this food. Going up and down stairs now is a musical event. It might just be a blend that doesn't mix with her, but something to consider if your doggo has a sensitive stomach. My young energetic pup will eat ANYTHING but she won't even sample this food. There is an off-putting chemical smell as soon as the bag is opened that had me reeling. And I think I was snookered by a previous review comparing this food to another I'd never heard of, Blackwoods. Turns out they are made by the same company. My picky dog seems to like this food. My main gripe is the kibble size. My large dog sometimes chokes on it when trying to eat quickly. Other than that, her coat looks great and she has slimmed down due to the protein being lower. My dog is 60 lbs. of quirks and a picky eater. She can be starving and just stare at her bowl of dry kibble. That is until I gave her Adirondack 21. I'm guessing it's the higher concentration of protein she loves, because now she's finally excited to eat and that makes her Mom feel like I'm doing a good job raising this nut ball dog. 3 picky eaters finally ALL of them like 1 kind! Thanks Adirondack! My 2 pittie mixes and my weim. Love it! I think I'm done trying new things, and I'm very thankful. Do them make wet food? My weim is 11 and we supplement her diet! Thanks chewy! Wonderful customer service!! My dog is REALLY PICKY when it comes to kibbles. He's picky about the smell, flavor, and texture of everything we've put on offer. It used to be a battle to get him to eat at all, much less eat enough to keep up with his demanding job as my service dog. This kibble? He gobbles it down eagerly. He also loves the Puppy and Active Dog formula I mix in, to sneak a few more calories in. He's definitely got more pep to his step during work too! I have 3 dogs. 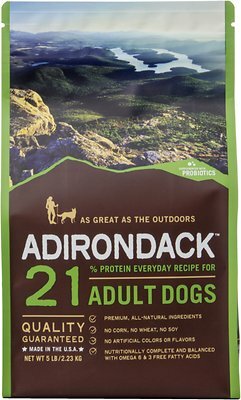 I am searching for a better dry dog food. I bought a 5 lb. bag to sample. They will not eat it. Not one kibble....not even when I added a little canned food. 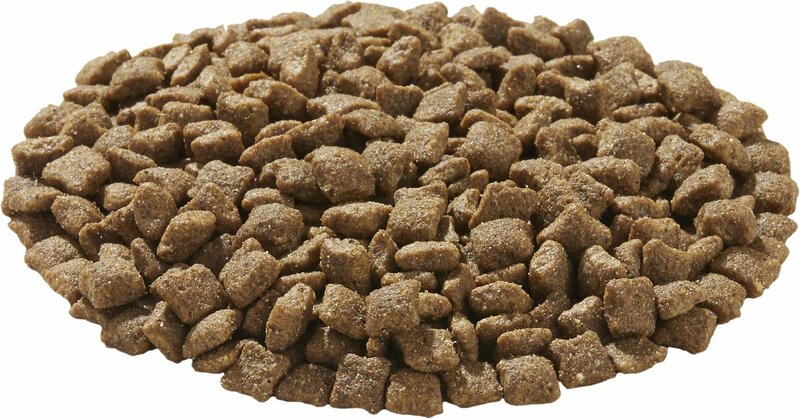 My black lab ate the canned dog food around the kibble; and spit out the kibble. My child loves this!! Switched to this as it was highly recommended!!! Received my order within a day. I'm forced to change my 14 year old Lab's food, and Adirondack seems to be agreeing with her.